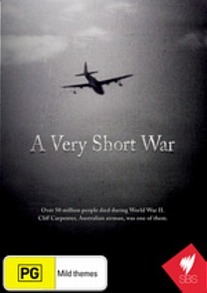 Written by Bill Young, A Very Short War is the true life biography about Australian aviator Cliff Carpenter who unfortunately died at the commencement of his military placement in Norway. Described by eloquently by Young, A Very Short War is a story about one man's short yet remarkable life who died on his 28th birthday and through interviews, letters and family stories, we learn that Carpenter was quite the aviator and even built his own plane in his backyard. The story is told through the family link of Bill Young who is the actual nephew of Cliff Carpenter and through painstaking research, he tells the story of his uncle during the deadly backdrop of world war II which not only goes into detail about the war such as the airplanes and positioning of guns on the planes but how his death caused a ripple effect through his family. Carpenter and his crew were unfortunately attacked by two Messerschmitt Bf110's which saw his life cut short and was the catalyst of Young's pilgrimage to Norway. As opposed to just a documentary, Young who is also the narrator of this film puts his own emotional stamp on this real-world story as World War II is not just seen through the eyes of his family but also through his eyes that creates a unique yet disturbing vision of this wartime conflict. With some strong yet emotional information, A Very Short War is also a warning about the destructive nature of war and how it touches everyone, even through time itself. Engaging to say the least.